RIMOUSKI, Quebec, March 02, 2018 (GLOBE NEWSWIRE) — Puma Exploration Inc. (the “Company” or “Puma”) (TSX-V:PUMA) is pleased to announce the signature of a non-binding Letter of Intent (LOI) with Trevali Mining Corporation (TSX:TV) setting the terms of a Strategic Alliance for the development of the Murray Brook Deposit (ML 252) and the exploration of combined mining properties in the Restigouche–Armstrong Belt region of New Brunswick. Trevali, a zinc-focused base metal mining company, operates four (4) commercially producing properties including the Caribou Mine, currently the only producing mine in New Brunswick. The Caribou Mine is located less than 10 kilometres east of the Murray Brook Deposit. It comprises an underground mine, a 3,000-tonne-per-day (tpd) processing mill, a flotation recovery plant, metallurgical and geochemical laboratories, as well as a tailings management facility. Under the terms of the LOI, Trevali will provide up to 7.5 million dollars funding to finalize the acquisition of the Murray Brook Deposit by Puma within the timeframe negotiated with Votorantim Metals Canada Inc. (“VMC”) and El Nino Ventures Inc. (“ELN”), with the initial trench deemed to be repayment of the recently announced $2.0 million loan received by Puma (see news released February 26th, 2018). Following the acquisition by Puma of the VMC and ELN interest, the Murray Brook Deposit (ML 252) shall be owned by TV and PUMA on a 75% and 25% basis respectively. Further exploration and development of the Murray Brook Deposit (ML 252) are to be funded proportionally thereafter subject to industry standard dilution clauses. Trevali will manage these programs including advanced engineering studies which will examine potential future production pathways for the polymetallic deposit. Once mine planning and operational requirements are concluded, the aim would be to move the Murray Brook Deposit to a production decision in a timely manner. Trevali brings to the Strategic Alliance its expertise in advanced stage project management, with a proven track record of efficiently moving assets from exploration, through permitting and development, to production. Trevali will also provide metallurgical consulting expertise, access to the Caribou metallurgical and geochemical labs, environmental design and monitoring, access to all relevant studies and reporting, CSR expertise, negotiation of agreements with the Mi’kmaq partners as well as access to the Caribou concentrator – thus reducing considerably operational costs for Puma. The Murray Brook Deposit, which comprises 484 hectares under mining lease 252, has a currently defined measured and indicated mineral resource of 5.28 million tons averaging 5.24% zinc, 1.80% lead, 0.46% copper, 68.9 g/t silver and 0.65 g/t gold containing 610 M lbs of zinc, 209 M lbs of lead and 11.7 M ounces of silver. The core of the mineral resource occurs in the West Zone (Zinc-Lead) which is 200 meters wide, extending from surface to 300 meters vertical and the true thickness of the massive sulphide body varies from 75 meters to 100 meters. The East Zone (Copper-Gold) is 100 meters wide, also extending from surface to 300 vertical meters and is mainly mineralized with gold and copper. On February 20th 2017, a NI 43-101 report was filed on SEDAR. Initial contact with the Department of Energy and Resource Development (ERD) of New Brunswick has brought a positive response for the proposed development of the Murray Brook Deposit, as well as Puma’s on-going exploration activities in the Bathurst Mining Camp. 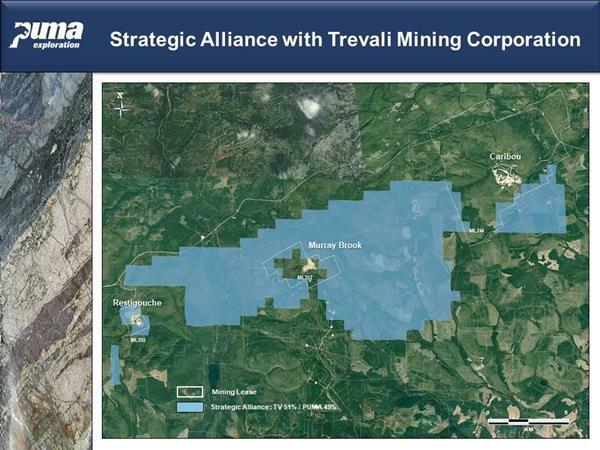 The Strategic Exploration Alliance between Trevali and Puma covers all existing claims held by both companies in the Murray Brook Project area as well as any new claims in the Restigouche–Armstrong Belt region covering more than 32,000 hectares of prospective land in the northern boundary of the Bathurst Mining Camp. 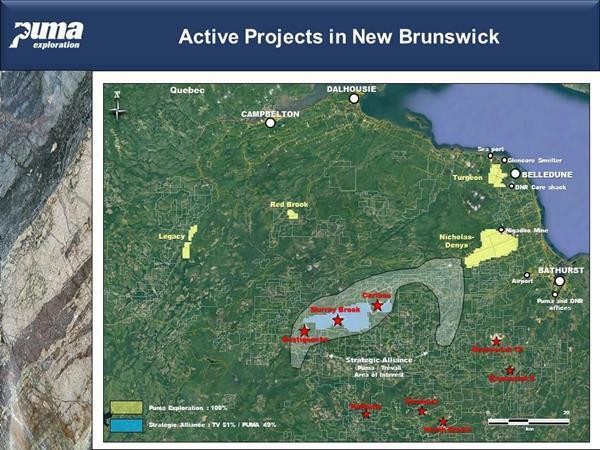 The Strategic Exploration Alliance will be managed by Puma who was awarded the 2014 Junior Mining Award by the Prospectors and Developers Association of New Brunswick for its on-going exploration work and valuable contributions to the Exploration, Mining and Minerals Industry of New Brunswick acquired since 2006. The Alliance includes six (6) properties for a total of 391 claim units (8,987 hectares) with the initial ownership set at 51% for Trevali and 49% for Puma, with standard dilution provisions, should one of the parties elect not to contribute. Through this Alliance, Puma gains access to four (4) new properties (1,286 ha.) all 100% previously held by Trevali. In addition, any new property acquired within the area of interest will be held 51%/49% by Trevali and Puma, unless one of them chooses not to participate in the acquisition. According to the Strategic Exploration Alliance, exploration programs and budget plans to be applied on the properties will be under the guidance of a Joint Technical Committee. “We are extremely pleased to join forces with Trevali Mining Corporation, who through their extensive experience and knowledge of the Bathurst Mining Camp, combined with their mining engineering expertise and strong financial position, will bring the Murray Brook Deposit closer to production stage. Proximity of the producing Caribou Mine to the Murray Brook Deposit will significantly reduce overall operating costs. We see all Puma’s shareholders benefitting once the Murray Brook Deposit enters into production. As well, the Strategic Exploration Alliance offers shareholders of Puma with extensive possibilities for growth.” concludes Marcel Robillard, President of Puma Exploration Inc.
”Trevali is pleased to be partnering with Puma Exploration on the advanced stage of the Murray Brook Deposit,” stated Dr. Mark Cruise, Trevali’s President and CEO. “The agreement comports well our Bathurst Mining Camp strategy by leveraging our infrastructure and operational expertise to expand our footprint within the Camp. In addition, the Strategic Alliance provides greater depth to our exploration efforts in the region, including access to Puma’s experienced exploration team." In connection with the signature of the LOI, Puma and Trevali also entered into a subscription agreement pursuant to which Trevali agreed to subscribe for CDN $500,000 worth of units in the capital of Puma. Each Unit shall be offered at a price of $0.09 and will consist of one common share and one-half of a warrant. The warrants will be fully transferrable, for a three year term and the exercise price will be $0.12. The proceeds will be used to advance the Strategic Exploration Alliance. The closing of the private placement, which is conditional upon the approval of the TSX Venture Exchange and other customary closing conditions, is expected to occur at the latest on March 15th, 2018. The completion of the transactions covered by the LOI is subject to the approval of the TSX Venture Exchange and the execution of definitive agreements before April 30th, 2018. Trevali is a zinc-focused base metal company with four mines: the wholly-owned Santander mine in Peru, the wholly-owned Caribou mine in the Bathurst Mining Camp of northern New Brunswick, its 80% owned Rosh Pinah mine in Namibia and its 90% owned Perkoa mine in Burkina Faso. Technical information provided in this news release was prepared and reviewed by Marcel Robillard, P.Geo., President and Dominique Gagné, P.Geo., Vice President Exploration of Puma Exploration, qualified persons as defined by NI 43-101. Neither TSX Venture Exchange nor its Regulation Services Provider (as that term is defined in the policies of the TSX Venture Exchange) accepts responsibility for the adequacy or accuracy of this release. Mr. Robillard and Mr. Gagné are not independent of the Company, as both are officers and shareholders thereof.